i remember going to the theater at least once a week with my parents starting in 1947 when i was 4. we ran a motel in bay view south of there. i took my wife on our first date there in jan of 1961. the movie was Summer Place. i won $10 there in 1955 playing bingo between the two shows. it was a great place to escape winter in upper michigan. we got our first tv in 1953 and that changed how much we went to the movies. I will always remember the owner, he dressed like he was a movie mogal from hollywood. I heard that he saved all the old movie posters and had two stacks about 2ft tall each. i have been in the antique business for 30 yrs and i can tell you who ever got those could actually retire the rest of their life, some would bring a lot of money, like King Kong, etc well maybe they are still around. I grew up a little south of the Log Cabin Inn, south of Gladstone. In the mid-40s, I would often ride my bike, Saturdays, the 2. 7 miles to the Rialto theater to watch the Lone Ranger serials, and similar flicks. That was 70 years ago, and I *think* it cost 10¢ … but it was NOT more than 20¢. If it was raining when the movie was over, the owner let me stay, free, for the second showing. (If it was still raining after that, I'd hang out at the post office across the street. I couldn't call home because we didn't have a phone yet. When we *did* get a phone, it was on a party-line, and the number was 468-F21. My aunt's number in Esky was 215-J, and other friends' number was 744-M. They were different times, then!). I just want to add to the comments from 2006 by Rebecca. I used to roller skate there when I was young. After that it was opened as a night club in the 90's , which I also patroned. Finally to Rebecca's comments about the drawing for the name for the second teen club. i was actually the person that came up with the name No Name. I was never awarded anything because I was a DJ and on their 'board'. After a few hours of going through names that were submitted we could not come up with anything fitting so I just said well why don't we name it 'No Name' and so it stuck. This building has a lot of good memories for me. 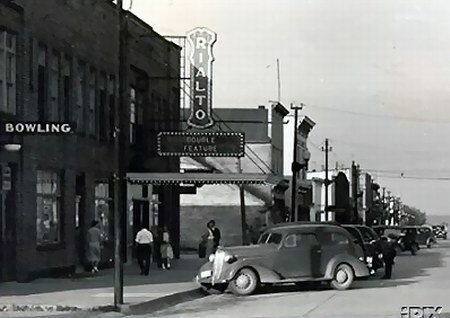 The Rialto was a wonderful theater John and Jean Vogt sold the business (they rented the space but owned the business) and the new owner didn't keep it operating for very long. It was converted to a roller rink around 1980. My parents owned the building and the Vogts would give them free passes fairly frequently - such a nice couple. BACK IN THE ''40''S AND 50''S, THE MOVIES RAN S-M-T, W-TH, F-SAT. THERE WAS ALWAYS A DOUBLE FEATURE. SATURDAY ALWAYS FEATURED AN OATER, STARRING SUCH LUMINARIES AS LASH LARUE,THE CISCO KID AND, OF COURSE, GENE AND ROY. jOHN VOGT WAS THE MANAGER. hE WAS A MAN OF SARTORIAL SPLENDOR, ALWAYS DRESSED AS IF HE JUST STEPPED OUT OF ESQUIRE. iT WAS THE PLACE TO BE BEFORE THE ADVENT OF TV. OFTEN WE WENT TO THE MOVIES NOT KNOWING WHAT WAS SHOWING BUT IT WAS THE PLACE TO BE. MANY OF THOSE MOVIES WERE NOT VERY GOOD BUT HOLLYWOOD DID NOT HAVE A VERY DEMANDING CLIENTELE. 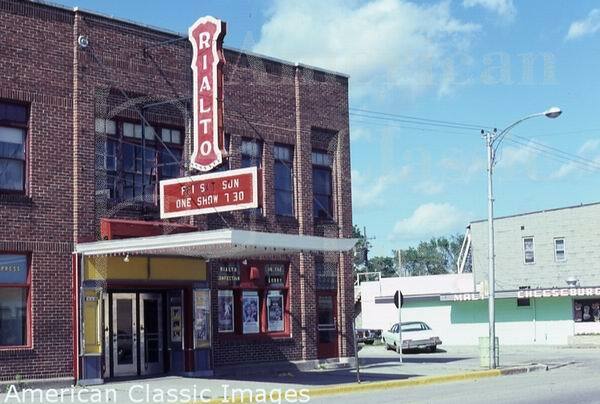 The Rialto operated until at least the late 1970s. As a child, my friends would go there and watch movies on Saturday afternoons for 35 cents. The theater had the traditional red chairs and curtains inside. 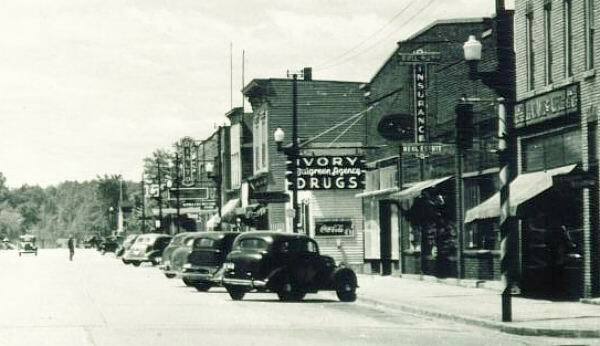 Located across the street was the Dairy Flo, so a great day would be a 35 cent movie and a 10 cent cone. 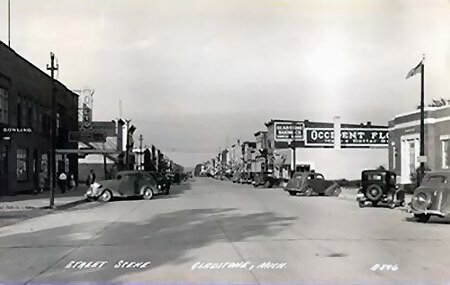 I moved away to Escanaba in 1976, and the theater was still going during my high school days, but had to compete with three theaters (later two) operating in Escanaba, seven miles away. I dont know much about this theater, I grew up in Gladstone, but the theater had been long gone by my era. I think during the 90s it housed a teen club. I remember they had a drawing to name the place and the winning name was Club No Name and before that I believe it was Club Gypsy. Those both folded and now it houses a seemingly ever changing variety of local businesses under the name The Rialto Centre.